A while ago I took some dessert over to a friend’s place for a BBQ. It was a warm sunny day, and I wanted to take something light and fresh, and being pressed for time – something quick and easy. I came across a Jamie Oliver dessert that ticked all the right boxes and more! I think jelly is a totally underrated dessert, and too often connected to hospitals and being sick. It is one of those wonderfully diverse ingredients to which just about any fruit can be added, and any colour or flavour can be made. It can be made in a big bowl for a children’s party or in little individual moulds for a more classy dessert. And for those who don’t mind mixing their jelly with their custard – you can make a very elegant dessert by making trifle (for a selection of some really great trifle recipe ideas click here). So what can make jelly even more delicious, sophisticated and grown-up? Why yes, by adding some champagne of course! It will be totally amiss of me to say that I entirely understand the chemical process which takes place. All I know is that if you add chilled champagne to the gelatine mixture and pour into a chilled mould, once set, the jelly retains the bubbles of the champagne. And what you end up with is a beautifully sweet champagne-flavoured jelly that still tingles on your tongue after every bite. The recipe uses a selection of summer berries, and while any fruit soaked in champagne obviously tastes delicious, it also looks amazing. You can put as few or as many berries you want into the dessert, and of course use any other fruit you like (except for pineapple and kiwi fruit, which will not set according to Jamie). I have adapted this recipe to fill two moulds, but if you need it for more people, simply multiply the ingredients proportionally to the amount of moulds you want to make. For my recipe I use a pink Moscato, which is a very sweet sparkling wine so I reduce the sugar slightly. But depending on how sweet you like things, and what type of champagne you use, you can add more or less sugar. I also use gelatine leaves rather than gelatine powder, just because it is easier to work with and the leaves don’t tend to cause any lumps. (Although, it is quite hard to come by, and after looking out for it for months now I finally found some in our local Woolworths in the baking section). If you are using gelatine powder, 1 teaspoon is equivalent to two gelatine leaves. Tip: If your gelatine mixture is lumpy, just pop it back into the microwave for a few more seconds and stir again (never let it reach boiling point). Place the gelatine sheets in a bowl of cold water and soak for a few minutes. Mix the hot water and caster sugar and stir until dissolved. Remove the gelatine leaves from the water and squeeze all the excess water out and stir the leaves into the hot water mixture. Fill the two moulds with a handful of berries each. 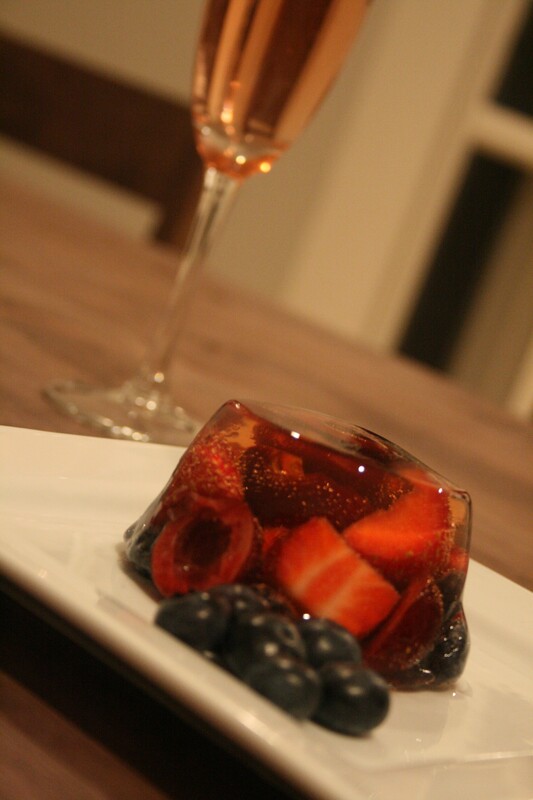 Pour the Moscato over the gelatine mixture and then pour the whole mixture slowly over the berries. Put the two moulds into the fridge for at least a few hours to set. Otherwise if you simply can’t wait that long, you can put the moulds into the freezer for an hour – just keep an eye so that it doesn’t freeze. Once set, take the moulds out of the fridge/freezer and dip each mould into a bowl of hot water for a few seconds to loosen the jelly from the mould. Turn it out onto your serving plate and garnish with a few pieces of leftover berries or a sprig of mint. Note: be sure that your Moscato, berries and even moulds are chilled completely before use to retain the bubbles in the jelly. If you have young children at home, they need not miss out on any of the fun. Simply follow the same recipe as above, replacing the champagne with lemonade, and replace the caster sugar with 1 teaspoon of cordial (I used Ribena). Follow the same steps and you will be a sure winner with your fizzy jelly! Yummy!! I will have to bookmark this one for warm summer days! Looks fantastic!! Your blog looks great! I look forward to reading more. Thanks Kelly 🙂 I appreciate you stopping by! It not only looks yummy but it is so beautiiful!